On November 8, 2018, Haitian President Jovenel Moise named Haitian-Japanese US Open Tennis champion Naomi Osaka Goodwill Ambassador for the promotion of Haitian sport. 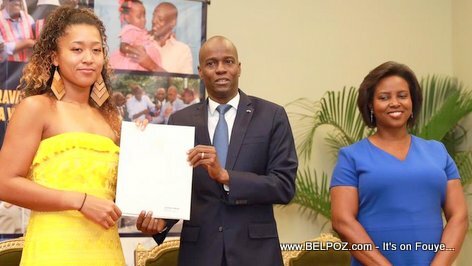 "I took the opportunity to give her a plaque of honor, in the name of the Republic of Haiti, as a sign of our gratitude," President Jovenel Moise said in a Twitter message. A special ceremony was organized in honor of Naomi Osaka and her family at the National Palace that day.